Over the past 3 decades, biologic medicines have played an increasingly significant role in healthcare around the world and have changed standards of care for patients. Now, biopharmaceutical research and commitment to value-based care have prompted the pursuit of biosimilar drugs, or biologic drugs that are “highly similar” to approved biologics. The current healthcare landscape demands additional therapeutic choices for providers and patients, and biosimilar development may present opportunities for competition in key therapeutic areas as many biologics approach patent expiration. Biosimilars may serve as lower-cost options to biologic drugs and hold the potential to create a more sustainable healthcare system by making room for innovation so increasing numbers of patients can continue to receive the best possible care. As the biosimilar market grows in the United States, all stakeholders will assess this new category of medicines with a focus on driving value-based care, which includes delivering quality care, effectively managing costs, and achieving the intended patient outcomes. To discuss these important issues, a summit comprised of multidisciplinary stakeholders was convened between November 30, 2016, and December 2, 2016, representing payers, physicians, patients, pharmacy benefit managers, specialty pharmacy providers, group purchasing organizations, biosimilar drugs manufacturers, employers, and healthcare consultants. The objectives of the summit were to discuss the latest information on the development of biosimilar agents, as well as challenges and potential solutions to their adoption for treating patients with cancer or autoimmune inflammatory diseases. This white paper presents highlights from the summit, along with recommendations for actionable steps to facilitate the adoption of biosimilars into clinical practice. Functional comparison of the stability profile of the proposed drug with that of the reference drug, accelerated and stress stability studies, and forced degradation studies to establish degradation profiles and to provide a direct comparison of the proposed drug with the reference drug. Thus, during the drug development phase, the goal is to demonstrate that the proposed drug is highly similar to the reference drug, which involves robust characterization of the proposed drug, including comparative physicochemical and functional studies with the reference drug. The information gained from these studies is critical to the overall drug assessment that, as a scientific matter, is necessary for the development of a proposed drug as a biosimilar. In addition, a 351(k) application for a proposed drug must contain, among other things, information demonstrating biosimilarity based on data derived from animal studies (including the assessment of toxicity) and a clinical study or studies (including the assessment of immunogenicity and pharmacokinetics or pharmacodynamics). Any information regarding differences between the proposed drug and the reference drug will be used to determine whether the statutory standard for biosimilarity has been met.1,2 The key point for the demonstration of comparability is not that the quality attributes of the biologics being compared are identical, but that they are highly similar, and the existing knowledge is sufficiently predictive that any differences in quality attributes (ie, the physicochemical characteristics) do not have an adverse impact on the safety or efficacy of the drug. In general, the information required to demonstrate comparability is different for small-molecule drugs than for biologic drugs (albeit some drugs that are biologics in science have been approved through the so-called 505 drug pathways).3 Although pharmacokinetic data demonstrating bioequivalence will suffice as a regulatory matter for small-molecule generic drugs, more clinical data are expected for biosimilars. Also, the active pharmaceutical ingredient is usually easier to define for small-molecule generic drugs; it can be more difficult to establish the same for biosimilars, given the use of unique cell lines and processes that can lead to slight structural variation between drugs. To accommodate this difference between drug classes, the pharmaceutical equivalence exercise was replaced from the regulatory “sameness” for small-molecule drugs to “highly similar” regulatory standards for biologics.4 Pharmacovigilance is important for all approved drugs, and the current mechanism serves as a way to detect any differences in rare adverse events. In January 2017, the FDA issued draft guidance on interchangeable biologics, which makes recommendations regarding the data and information needed to support an interchangeability designation, as well as considerations for switching study design and analysis.8 However, the FDA emphasizes that the requirements may depend on the drug under consideration. In discussing the new guidance, Leah Christl, PhD, Associate Director for Therapeutic Biologics in the Center for Drug Evaluation and Research stated, “There is no single data package that will work for all proposed interchangeable products.”9 Manufacturers must consider “the totality of factors” when determining the type and amount of supportive data to demonstrate interchangeability, including the complexity of a drug and drug-specific immunogenicity risk. The focus of a comparative clinical trial is to identify the potential differences between a biosimilar and a biologic drug in an adequately sensitive population of patients. Thus, the trial will mostly be an equivalence study within a very narrow patient population. When the analytical data of structure and function are robust, the comparative clinical trial can be more focused and more targeted, because there are fewer residual questions. In January 2017, the FDA released a guidance for industry on the nonproprietary naming of all biologic drugs, including biosimilars.12 The primary purpose of this guidance was to prevent inadvertent substitution and facilitate pharmacovigilance, enabling healthcare providers to accurately attribute adverse events. Biologics do have brand names (unlike most generics), and many biologics that share nonproprietary names today get confused with each other.13 The guidance states, “An applicant for a proposed biosimilar product submitted under section 351(k) of the PHS Act should propose a suffix composed of four lowercase letters for use as the distinguishing identifier included in the proper name designated by FDA at the time of licensure. Such submissions can be made during the investigational new drug application (IND) phase or at the time of BLA submission. An applicant should submit up to 10 proposed suffixes…in the order of the applicant’s preference…including any supporting analyses of the proposed suffixes for FDA’s consideration.”12 The proposed suffix of a biosimilar should be unique, devoid of meaning, 4 lowercase letters (with at least 3 distinct letters), nonproprietary, added to the core name with a hyphen, and free of legal barriers that would restrict its use.12 To date, only biosimilars have been given suffixes, and originator biologic drugs have not. Another key regulatory concept for biosimilars is extrapolation, meaning that the biosimilar can be labeled for one, some, or all the indications of its reference drug. The originator drug requires a clinical trial for each indication, whereas a biosimilar drug does not, which makes the scientific case for the analytical match supporting approval of indications that are not studied clinically for the biosimilar. The process that contributes to the scientific justification of extrapolating to the other indications is based on the molecular match established with high similarity.14 In the context of biosimilars, the extrapolation of efficacy and safety data from one indication to another may be considered if biosimilarity to the reference drug has been shown by a comprehensive comparability program described above (just as it is routinely done in support of manufacturing changes15), including the analysis of safety, efficacy, and immunogenicity suitable to detect potentially clinically relevant differences. Demonstrating biosimilarity is different from stand-alone drug development; the approach and the development program should be different based on the intended outcome to demonstrate biosimilarity. Analytical similarity data are the foundation of biosimilar drug development for understanding the relationship between quality attributes and the clinical safety and efficacy profiles to determine residual uncertainty about the biosimilarity and to predict any expected clinical similarity from the quality data. The nature and scope of clinical studies will depend on the extent of the residual uncertainty about the biosimilarity of the 2 drugs after conducting an extensive analytical similarity assessment. Comparative clinical studies are necessary to support a demonstration of biosimilarity if there are residual uncertainties about whether there are clinically meaningful differences between the proposed biosimilar and the reference drug. The content of a biosimilar development program is based on a stepwise development, and approvability is based on the totality of the evidence submitted to the FDA by the drug manufacturer. The FDA has recently released a guidance revising the nonproprietary naming of all biologic drugs, including biosimilar drugs.12 Extrapolation of one molecule to another, not one indication to another, requires careful analysis of patient factors, disease factors, and clinical end points, and represents a complex mix of scientific and regulatory analyses. 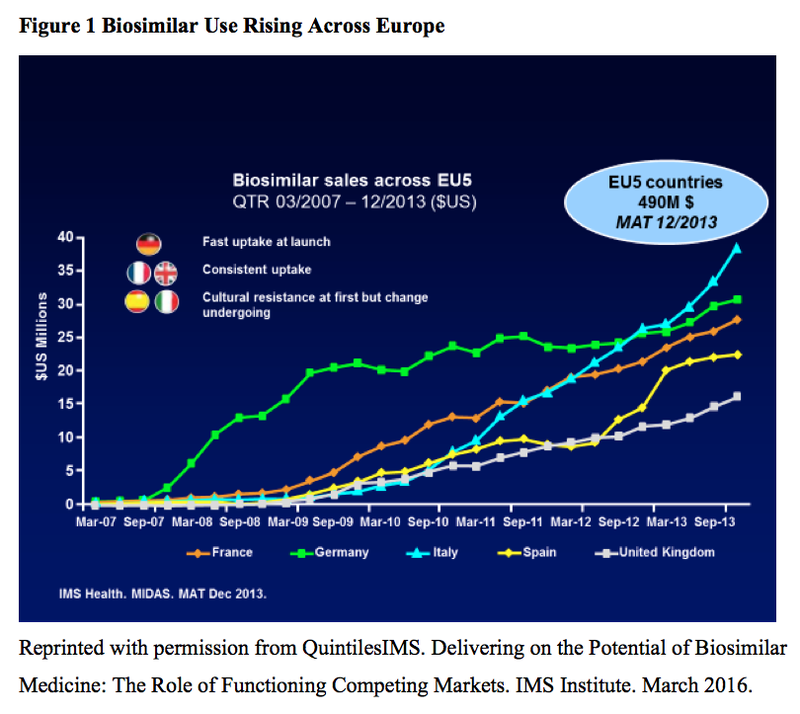 In the European Union, experience with biosimilars spans more than a decade, and includes 32 biosimilars for 12 originator biologics.16 According to data from IMS Health’s MIDAS platform, biosimilar use has been steadily rising across the European Union, with rapid adoption of biosimilars in Germany shortly after launch, slower but consistent adoption in the United Kingdom and France, and slower adoption in Spain and Italy, presumably as a result of initial cultural resistance (Figure 1).17 However, in an October 2015 study of 200 physicians across Europe, less than 25% of the providers in France, Spain, and the United Kingdom had prescribed biosimilars.18 The European Union experience has shown that the more physicians are being educated, the more they will incorporate biosimilars in their practice. This, along with educating pharmacists about biosimilars, is likely key to the successful adoption of biosimilars in the future. In some countries, such as Denmark and Belgium, biosimilar incorporation has been mandated by the government (eg, the infliximab biosimilar in rheumatoid arthritis). Other countries, such as Spain, use a more incentive-based approach, where the hospital will pay the physician for academic development (eg, pay for registration at a major meeting) in return for the physician’s use of a biosimilar. 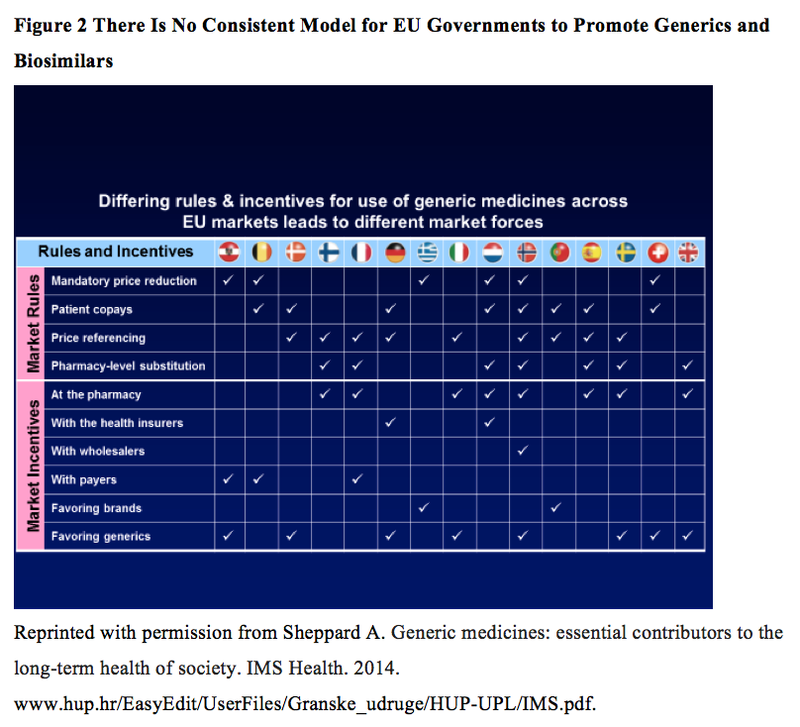 There is no consistent model for governments in the European Union to promote biosimilar agents. As shown in Figure 2, although Spain, Italy, Greece, and Norway apply mandatory price reductions and pharmacy-level substitution, France, the United Kingdom, Sweden, Finland, and other countries utilize market incentives at the pharmacy, with payers, and/or with wholesalers. To realize the full potential of biosimilars and to create a sustainable multisource biologics market, all stakeholders need to understand how market incentives work. The European Union is leading in the development and approval of biosimilars, with approved biosimilar agents being marketed for somatropin, epoetin alfa, epoetin zeta, filgrastim, infliximab, follitropin alfa, insulin glargine, etanercept, enoxaparin sodium, adalimumab, teriparatide, and rituximab.16 The United States, which is usually a leader in biotechnology, is very much behind in biosimilar development; however, this new class of drugs are slowly making their way into the US marketplace, with 2 now launched. In March 2015, the FDA approved the first biosimilar drug, Zarxio (filgrastim-sndz), as an alternative to the reference drug Neupogen, and this biosimilar appears in the National Comprehensive Cancer Network Guidelines for Myeloid Growth Factors and in many drug formularies. Since then, 4 other biosimilars have been approved by the FDA, including Inflectra (infliximab-dyyb), Erelzi (etanercept-szzs), Amjevita (adalimumab-atto), and Renflexis (infliximab-abda), and 3 others have positive opinions from FDA advisory committees. An additional 8 applications have been submitted to the FDA and announced by their manufacturers. Moreover, phase 3 clinical trials of biosimilars are completed or are underway for several antineoplastic biologics, including trastuzumab in HER2-positive breast cancer, rituximab in follicular lymphoma and indolent non-Hodgkin lymphoma, bevacizumab in non–small-cell lung cancer, and cetuximab in head and neck cancer. In reality, biosimilars are often priced approximately 20% to 30% lower than their reference biologic, which has the potential to translate into substantial cost-savings to the healthcare system.19 However, the degree of rigor of the evidence that is necessary for regulatory approval of a new biosimilar highlights the need to ensure the safety and effectiveness of these agents.19 Most of the other myths can be dispelled with the information presented in the first section of this article. The 3 additional facts discussed below are also relevant. Once accepted by providers, another challenge for US physicians will be to introduce biosimilars to their patients. Here, patient education, especially addressing potential concerns about efficacy and safety, will be key. It is hoped that patients in the United States will ultimately become like their European counterparts and embrace lower-cost alternatives to expensive biologics. Over a decade or so, the adoption of biosimilars in the supportive care of patients with cancer and patients with autoimmune inflammatory conditions, such as rheumatoid arthritis, has steadily increased in the European Union as new biosimilars have become available. Although there is still significant resistance to the adoption of biosimilars by providers in the European Union, countries have taken different approaches to encouraging their use, including the education of physicians and pharmacists about biosimilars, financial incentives for the use of biosimilar agents, and in some cases, the mandatory use of biosimilars, taking the decision as to whether to use them out of the hands of providers. In the United States, currently 5 biosimilars have been approved by the FDA in oncology, rheumatology, or inflammatory bowel disease, and more oncolytics are in late-phase clinical development. The adoption of biosimilars into clinical practice will require teaching physicians and patients about the regulatory rigor associated with biosimilar drugs approval, as well as the potential economic advantages inherent in their use. Also, to the extent that the originator manufacturer matches the biosimilars offer, the prejudice is always against adding the biosimilar to the available drugs. Biosimilar manufacturers may benefit from a clinically driven value proposition by providing services that improve population-based patient outcomes by enhancing access and inducing clinical behavior change to address the current unmet needs. Payers may nevertheless still negotiate on price, demanding a significant price discount over the branded biologics. Developing data to support access and address the present unmet needs may allow providers who are concerned with immunogenicity and variability of efficacy in the absence of data to favorably compare the biosimilar with the branded biologic agent and incentivize the adoption of the biosimilar.23 Payers are in favor of a multisource environment and appreciate that without a market, biosimilars cannot continue to be available. From the physician’s perspective, physician uptake of a biosimilar may be limited by factors inherent in the design of the clinical trial registration program, including perceived clinical differences across study designs using noninferiority, equivalency, or superiority hypotheses for comparisons of the biosimilar with the originator drug, even though this is not the basis of the FDA’s approval decision. In addition, concerns may exist regarding the extrapolation of study data into clinical care, because the biosimilar debate has raised the issue of variations from batch to batch in the biologic properties of the drugs, and differences in patient characteristics and in standard of care within studies evaluating the originator drug and the biosimilar. Unanticipated long-term safety concerns may be voiced regarding adverse events of clinical interest that may not be demonstrated in the trial’s duration that would otherwise be acceptable for regulatory approval. Finally, the lack of real-world experience with switching strategies from innovator drugs to biosimilar drugs may introduce hesitancy into clinicians’ adoption of biosimilars; however, in some instances, the FDA is requiring these single-transition studies as part of the initial approval. “Biosimilarity is a regulatory, not a scientific, concept. Thus, it’s interpreted in different manners, and several medical societies and patient associations have expressed their reticence to biosimilar use,” said one summit participant. According to the summit panel, payers agree that the biosimilar manufacturer must put a substantial amount of effort into educating all healthcare stakeholders about biosimilars. In addition, the panel stated that payers would be willing to supplement educational efforts if a significant savings opportunity was available, but the lack of payer resources makes widespread educational campaigns challenging in the absence of pharmaceutical company support. In general, if the FDA has approved a biosimilar drug, most providers will be accepting the biosimilar’s equivalency to the reference drug. However, the panel noted that there would still be a few providers who will remain cautious, requiring additional assurance that biosimilars are safe and effective, especially for indications where clinical trial data are lacking. The panel added that as with all drugs, providers must be vigilant when they prescribe biosimilars, just as they are with any biologic drugs, and they must ensure that there are no clinically meaningful differences in safety and efficacy. It is also critical that patients are educated and accept the prescribed biologic. The panel advised that providers may not have the time or resources to fully educate their patients, and portions of the educational component may be more efficiently delivered with assistance of the health plan and the drug manufacturer. If patients use the drug, patient support programs from the biosimilar manufacturer need to be as good as, or better than, support programs offered by the reference drug manufacturer. Providers mentioned the lack of understanding of reimbursement for biosimilars, a topic that providers find confusing. In the United States, physicians generally have greater freedom of drug choice; however, for drugs that are covered under Medicare Part B, the standard reimbursement formula for a biosimilar drug will be based on the biosimilar ASP plus 6% of the reference drug, a strategy that is designed to remove incentives to use one drug over another. However, because of the budget sequester in 2012, providers are now reimbursed for oncolytics at ASP plus 4.3%, and these sequester cuts have been extended through 2024. Several providers on the panel expressed concern that payers, not providers, will be making decisions as to whether individual patients will receive a biosimilar in place of the originator biologic drug, and that the provider will not be aware that the switch had been made. A provider from the European Union indicated that his hospital, rather than he or his staff, make the decision to use a biosimilar or an originator biologic for his patients. Clearly, a multidisciplinary formulary committee consisting of physicians, pharmacists, administrators, and payers is key to solving some of these issues. Moreover, several payers expressed that they still have questions regarding how to develop medical policies so that providers feel comfortable with the biosimilar reimbursement process. Payers and providers indicated that they anticipate that the adoption of biosimilars will offer a compelling savings opportunity and could be a strategy to reduce specialty drugs spending overall; however, this is dependent on the ability to generate a magnitude of cost-savings for a health plan and the availability of adequate reimbursement for physicians. This also holds true for physicians who may feel that they will be missing out on potential revenue dollars generated by biosimilars, because there still is ambiguity about what the cost-savings will actually be. Several panelists suggested that provider confidence regarding payer involvement in biosimilar drug uptake would benefit from improved payer communication with provider groups. Payers can begin the process of engaging with hospital systems and large group practices to start a dialogue, determine the level of understanding, and assess what it would take them to engage in a collaborative effort. Payers can modify the current information technology infrastructure to allow for seamless approval and reimbursement for miscellaneous biosimilar codes to promote earlier uptake of the biosimilar. Payers can also adjust physician fee schedules to encourage physicians to utilize lower-cost alternatives. Payers at the summit still had questions about how to develop medical insurance policies so that providers feel comfortable that they would be fairly reimbursed for utilizing biosimilar drugs. In addition, panelists questioned whether the development of a coverage policy should apply only to patients who would be considered as newly starting the biosimilar or if medical insurance policy should apply to all potential patients, including those already receiving treatment with the originator biologic. Payers noted that they need to be careful with how biosimilar medical policies are drafted to avoid delaying or slowing the uptake of biosimilars, or “force feeding” the use of biosimilars on providers, and whether providers will feel comfortable switching patients who are receiving long-term therapy to new biosimilars entering the market. Panelists noted that each therapeutic category likely needs to be evaluated separately to drive market share and optimize savings, and that payers and providers should work together when evaluating each drug and in the development of medical insurance policies. Providers could provide additional insight into what drugs they are comfortable with, the correlating clinical trial data and best practices, and who are the most appropriate patients to initiate biosimilar therapy. This could serve as a foundation for payers and providers to actively engage with one another and to play a key role in the implementation of medical policies for payers, providers, and patients. Although biologics have had a significant impact on the healthcare system, until recently many of these biologics have not faced much competition. With the introduction of biosimilars to an area that has had little-to-no competition, the summit panelists observed that biosimilars have the opportunity to offer more choices, at more affordable prices. Payers and providers agreed that if the savings with biosimilars materialize, depending on the health plan benefit design, the money saved could be used in other patient-centric ways, such as to lower member premiums and copayments. There was no general agreement among panel members on what the drug cost-savings need to be, with suggestions ranging from 25% to 40%. As more biosimilars are approved, this will create competition that could cause these drugs to thrive and the cost-savings to increase. Although payers have an opportunity for cost-savings generated by increased competition, they also face a significant risk if they are unable to optimize the potential value of lower-cost options. The emerging biosimilars market presents an opportunity for pharmaceutical manufacturers, as well as for health plans, providers, and patients. Biosimilars have the potential to save the US healthcare system billions of dollars over the next few decades. It is therefore imperative that health plans and providers collaborate and accept biosimilars to increase their adoption. Without this collaboration or alignment of incentives, biosimilars may struggle to attain a meaningful market share, limiting their cost-savings potential. This may also have a negative impact on the future of biosimilars entering the market. Pharmaceutical manufacturers may be reluctant to invest in the development of biosimilar drugs if a return on that investment is unlikely. This highlights the need for payers and providers to engage in mutually beneficial collaborations to promote the successful adoption of biosimilars and generate cost-savings for the healthcare system. Dr Rifkin is on the advisory board dealing with biosimilars for Amgen, Coherus, EMD Serono, and Pfizer (Hospira). Dr Li is on advisory boards for Eli Lilly and Pfizer, and is on the advisory board for Mylan; is on the speaker’s bureau for Apobiologix and for Pfizer; and is a consultant to New Century Health. Dr Woollett reported no conflicts of interest. 1. US Food and Drug Administration. Quality considerations in demonstrating biosimilarity of a therapeutic protein product to a reference product: guidance for industry. April 2015. www.fda.gov/downloads/Drugs/GuidanceComplianceRegulatoryInformation/Guidances/UCM291134.pdf. Accessed August 4, 2017. 2. US Food and Drug Administration. Guidance for Industry: Q3A Impurities in New Drug Substances. Revision 2. June 2008. www.fda.gov/downloads/Drugs/GuidanceComplianceRegulatoryInformation/Guidances/ucm073385.pdf. Accessed August 9, 2017. 3. Li E, Ramanan S, Green L. Pharmacist substitution of biological products: issues and considerations. J Manag Care Spec Pharm. 2015;21:532-539. 4. McCamish M, Woollett GR. Molecular “sameness” is the key guiding principle for extrapolation to multiple indications. Clin Pharmacol Ther. 2017;101:603-605. 5. Christl L. FDA’s overview of the regulatory guidance for the development and approval of biosimilar products in the US. www.fda.gov/downloads/drugs/developmentapprovalprocess/howdrugsaredevelopedandapproved/approvalapplications/therapeuticbiologicapplications/biosimilars/ucm428732.pdf. Accessed August 4, 2017. 6. Jørgensen KK, Olsen IC, Goll GL, et al; for the NOR-SWITCH Study Group. Switching from originator infliximab to biosimilar CT-P13 compared with maintained treatment with originator infliximab (NOR-SWITCH): a 52-week, randomised, double-blind, non-inferiority trial. Lancet. 2017;389:2304-2316. Erratum in: Lancet. 2017;389:2286. 7. Kurki P, van Aerts L, Wolff-Holz E, et al. Interchangeability of biosimilars: a European perspective. BioDrugs. 2017;31:83-91. 8. US Food and Drug Administration. Considerations in demonstrating interchangeability with a reference product: guidance for industry. Draft guidance. January 2017. www.fda.gov/downloads/Drugs/GuidanceComplianceRegulatoryInformation/Guidances/UCM537135.pdf. Accessed July 10, 2017. 9. US Food and Drug Administration. From our perspective: interchangeable biological products. Updated January 18, 2017. www.fda.gov/Drugs/NewsEvents/ucm536528.htm. Accessed August 9, 2017. 10. US Food and Drug Administration. Scientific considerations in demonstrating biosimilarity to a reference product: guidance for industry. April 2015. www.fda.gov/downloads/Drugs/GuidanceComplianceRegulatoryInformation/Guidances/UCM291128.pdf. Accessed August 4, 2017. 11. Dranitsaris G, Dorward K, Hatzimichael E, Amir E. Clinical trial design in biosimilar drug development. Invest New Drugs. 2013;31:479-487. 12. US Food and Drug Administration. Nonproprietary naming of biological products: guidance for industry. January 2017. www.fda.gov/downloads/drugs/guidances/ucm459987.pdf. Accessed August 4, 2017. 13. McCamish M, Gallagher AM, Orloff J. Biosimilar by name and biosimilar by nature. RPM Report. July/August 2013. www.sandoz.com/sites/www.sandoz.com/files/rpm-report.pdf. Accessed July 26, 2017. 14. Li E. Considerations for using biosimilars in practice: pharmacist substation, indication extrapolation, and pharmacovigilance. Presented at the 49th ASHP Midyear Clinical Meeting and Exhibition; December 7-11, 2014; Anaheim, CA. 15. ICH Expert Working Group; International Conference on Harmonisation of Technical Requirements for Registration of Pharmaceuticals for Human Use. ICH Harmonised Tripartite Guideline: Comparability of Biotechnological/Biological Products Subject to Changes in Their Manufacturing Process: Q5E. Current Step 4 version. November 18, 2004. www.ich.org/fileadmin/Public_Web_Site/ICH_Products/Guidelines/Quality/Q5E/Step4/Q5E_Guideline.pdf. Accessed July 26, 2017. 16. QuintilesIMS. Patient access to costly biologics and the regulatory status of biosimilars differs globally. Updated August 2017. www.quintiles.com/microsites/biosimilars-knowledge-connect/biosimilars-by-region. Accessed August 14, 2017. 17. IMM Health. MIDAS. Data on file. December 2013. 18. Chanroux L. EU doctors’ perceptions of rheumatoid arthritis drug market. PharmaPhorum; October 13, 2015. https://pharmaphorum.com/views-and-analysis/eu-doctors-perceptions-of-rheumatoid-arthritis-drug-market/. Accessed August 14, 2017. 19. Lyman GH, Rifkin RM, Schellekens H. Biosimilars: the future of sustainable cancer care. ASCO Connection. February 23, 2016. https://connection.asco.org/magazine/current-controversies-oncology/biosimilars-future-sustainable-cancer-care. Accessed August 4, 2017. 20. Learch C, Choe SH. Biosimilars gain widespread adoption by health plans. Press release. July 11, 2017. http://avalere.com/expertise/life-sciences/insights/biosimilars-gain-widespread-adoption-by-health-plans. Accessed July 26, 2017. 21. Woollett G, Love K, Dixon T. Five obstacles to competition in the United States biologics market: biosimilars have the opportunity to foster competition, but there are policy and market barriers that limit the growth of a functioning market. May 31, 2017. http://avalere.com/expertise/life-sciences/insights/five-obstacles-to-competition-in-the-united-states-biologics-market. Accessed July 26, 2017. 22. IMS Health. Shaping the biosimilars opportunity: a global perspective on the evolving biosimilars landscape. 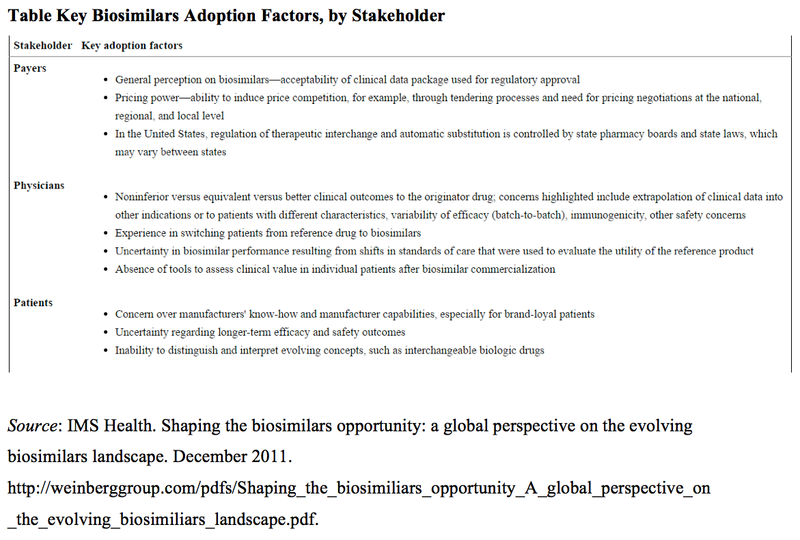 December 2011. http://weinberggroup.com/pdfs/Shaping_the_biosimiliars_opportunity_A_global_perspective_on_the_evolving_biosimiliars_landscape.pdf. Accessed August 4, 2017. 23. Rompas S, Goss T, Amanuel S, et al. Demonstrating value for biosimilars: a conceptual framework. Am Health Drug Benefits. 2015;8:129-139. 24. Brennan Z. US Supreme Court: no six-month wait for biosimilars after FDA approval. Regulatory Focus.June 12, 2017. www.raps.org/Regulatory-Focus/News/2017/06/12/27881/US-Supreme-Court-No-Six-Month-Wait-for-Biosimilars-After-FDA-Approval/. Accessed July 26, 2017. 25. Reichert JM. Next generation and biosimilar monoclonal antibodies: essential considerations towards regulatory acceptance in Europe: February 3-4, 2011, Freiburg, Germany. MAbs. 2011;3:223-240. 26. Committee for Medicinal Products for Human Use, European Medicines Agency. Guideline on similar biological medicinal products containing monoclonal antibodies—non-clinical and clinical issues. May 30, 2012. EMA/CHMP/BMWP/403543/2010. www.ema.europa.eu/docs/en_GB/document_library/Scientific_guideline/2012/06/WC500128686.pdf. Accessed August 4, 2017. 27. Cohen H, Beydoun D, Chien D, et al. Awareness, knowledge, and perceptions of biosimilars among specialty physicians. Adv Ther. 2017;33:2160-2172. 28. Pearson CF. Medicare beneficiaries will pay more for biosimilars than for their biologic reference products in Part D: two potential policy changes would reduce out-of-pocket costs for consumers. Press release. April 12, 2016. http://avalere.com/expertise/life-sciences/insights/medicare-beneficiaries-will-pay-more-for-biosimilars-than-for-their-biologi. Accessed July 26, 2017. 29. Miller S. The $250 billion potential of biosimilars. April 23, 2013. http://lab.express-scripts.com/insights/industry-updates/the-$250-billion-potential-of-biosimilars. Accessed August 4, 2017. 30. Congressional Budget Office. Cost estimate: S. 1695: Biologics Price Competition and Innovation Act of 2007. June 25, 2008. www.cbo.gov/sites/default/files/cbofiles/ftpdocs/94xx/doc9496/s1695.pdf. Accessed August 4, 2017. 31. Mulcahy AW, Predmore Z, Mattke S. The cost savings potential of biosimilar drugs in the United States. The RAND Corporation. 2014. www.rand.org/pubs/perspectives/PE127.html. Accessed August 15, 2017.